In an attempt to find out early and sensitive clinical signs of experimental methylmercury poisoning, physiological indices of wakefulness, slow-wave sleep, paradoxical sleep, body temperature and heart rate were examined during the development of methylmercury toxicity with rats which were chronically implanted with EEG and EMG electrodes or thermistor probes and ECG electrodes. These physiological indices were found to provide early and sensitive signs in experimental methylmercury poisoning with adult rats as compared with the behaviorally-observed neurological signs of motor incoordination. The reduction of paradoxical sleep, its altered circadian rhythm and the lowered body temperature were long-lasting signs as compared with quick recovery from the reduced wakefulness and the lowered heart rate. Analysis of brain monoamines and their metabolites showed that the concentrations of noradrenaline, 3-methoxy-4-hydroxyphenylethyleneglycol and 5-hydroxytryptamine of the frontal cortex of the methylmercury-administered rats were lowered during the dark period, indicating that methylmercury lowered the turnover of central monoamine metabolisms. 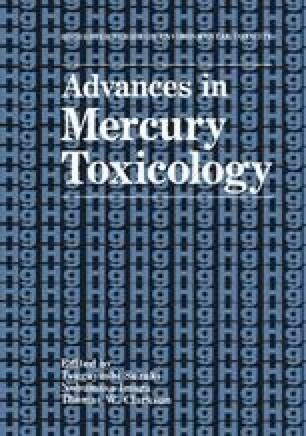 It was suggested that the reduction of paradoxical sleep and its altered circadian rhythm were mediated through an inhibitory action of methylmercury on central monoaminergic mechanisms, in addition to the well-documented inhibitory effect of methylmercury on central cholinergic mechanisms.